The LAB120 automatic CD Labeler is the solution to apply safely and accurately a label on a CD, DVD, CD-R or CD-CarD as well. 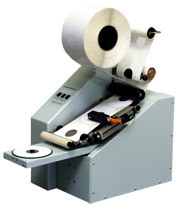 The LAB120 can be used with any kind of Label quality, from standard paper up to photo glossy paper for inkjet printing. Outside Label Diameter: 117mm max. Inside Label Diameter: 18mm min. Paper Quality: Photo Glossy/ velin/ kromekote/ etc.